This series is the first English-language translation of Der Weltkrieg, the German official history of the First World War. Originally produced between 1925 and 1944 using classified archival records that were destroyed in the aftermath of the Second World War, Der Weltkrieg is the inside story of Germany’s experience on the Western Front. Recorded in the words of its official historians, this account is vital to the study of the war and official memory in Weimar and Nazi Germany. Although exciting new sources have been uncovered in former Soviet archives, this work remains the basis of future scholarship. It is essential reading for any scholar, graduate student, or enthusiast of the Great War. 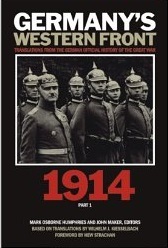 This volume cover the outbreak of war in July-August 1914, the German invasion of Belgium, the Battles of the Frontiers, and the pursuit to the Marne in early Septemeber 1914. The first month of war was a critical period for the German army and, as the official history makes clear, the German war plan was a gamble that seemed to present the only solution to the riddle of the two-front war. But as the Moltke-Schlieffen Plan was gradually jettisoned through a combination of intentional command decisions and confused communications, Germany’s hopes for a quick and victorious campaign evaporated.